This is a small software that permits to perform a scan of a directory and indexing every files by their extension. You can access and manage all files quickly grouped by extension, everywhere they are located. With Windows 7 finding files by their types in a directory is fairly simple but what if you want to scan of a directory and index every file by their extension? The Extension Indexer provides the best solution for your needs. It is an open source, lightweight app which can organize your specified folder content by file types (i.e. by extensions). You can for instance view all of the files which are stored on your desktop to perform operations over Excel sheets, text files, shortcuts (.LNK), etc. You will just have to define the source folder and it will list down all the files by their types, so you can easily perform operations over them. The interface is kept simple with two file operations listed – Move and Delete Selected Files. It will particularly come useful for those who need to clean folders by searching for files by their file types. To start off, click Select folder to Analyze to select folder. It will immediately create a list of file types at the left side, waiting for user to select an extension to perform further operations. 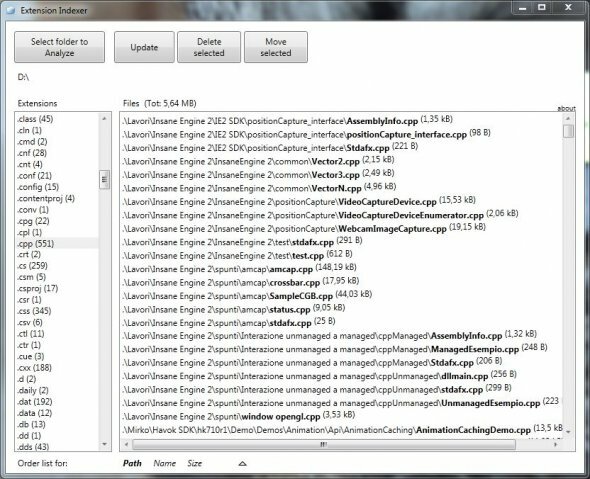 Extension Indexer also shows the total number of files and size for each listed extension. The screenshot displayed above shows all the CPP files from the desktop folder with total number of files and size. Organizing your file types couldn’t be easier now. Clicking on a specific extension will reveal all the files which are scattered in different sub folders, making it easier for you to locate them. You can select any file either to move or delete it. Unfortunately, users can’t specify more than one folder, which we feel is a major drawback. Extension Indexer runs on Windows XP, Windows Vista, and Windows 7 and is currently free, so why not give it a test run!